Just a quick post for you today guys showing you this beautiful new polish form Morgan Taylor. Party At The Palace is from their Cinderella collection. 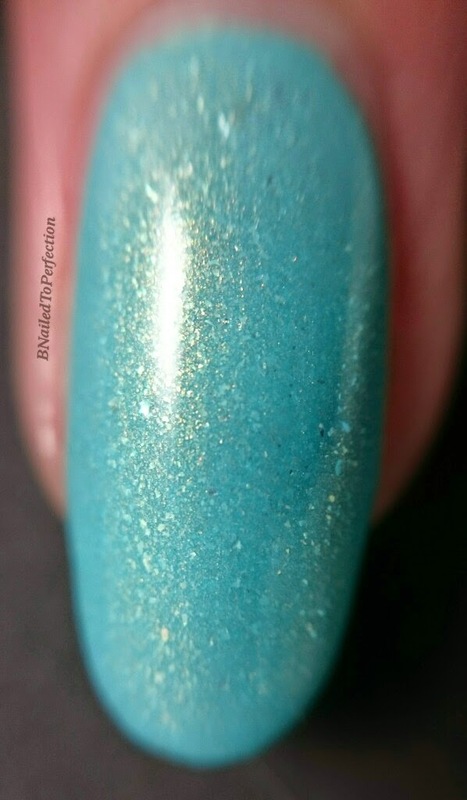 It is a gorgeous aqua blue with tiny flakes of gold in it which makes the polish shimmer, even indoors. This was 3 thin coats and the formula was nice to apply. You can really see the flakes in this macro shot..aren't they beautiful?! That's it for today guys. Sorry I didn't take more pictures of this polish. I used it as a base for a weekly nail art challenge on Instagram, which was Ikat nails, and I wasn't happy with the end mani so didn't take many pictures.